In an era of safety conscious motoring, Jaguar has managed to combine beautiful, fast sports car design with the latest pedestrian impact technology to create a world first with the all-new XK. Today at the Frankfurt motorshow Jaguar engineers premiered the Pyrotechnic Pedestrian Deployable Bonnet System (PDBS) a state-of-the-art advanced safety feature. Within the 'blink of an eye' In the unfortunate event of a pedestrian impact, the deployable bonnet on the new XK automatically ‘pops’ up a few inches, to create a cushioning effect between the engine and the bonnet. This helps to isolate the pedestrian from hard points in the engine compartment - and takes place in less than a tenth of the time it takes to blink an eye. Jaguar is one of the first manufacturers to meet Phase One of new European safety legislation using an active deployable bonnet system. The new standards are designed to help mitigate the severity of injuries to pedestrians in the event of a collision with a car. Legislation in the European market requires manufacturers to commit to a two-phase introduction of a range of active and passive safety improvements on all new cars to improve the protection of pedestrians in case of accident. 'The Jaguar design team embraced the idea of using a deployable bonnet when it was first considered during early concept discussions on the new XK. This clever feature saves between 50 and 65mm in height off the bonnet surface and a similar amount off the roofline, allowing the design team to maintain a very low, sleek Jaguar sports car profile on the new XK.' said Ian Callum, Jaguar Cars Design Director. The Jaguar Pyrotechnic Pedestrian Deployable Bonnet provides an innovative solution to these legislative requirements whilst ensuring that the sleek lines that customers expect from Jaguar sports cars can be retained. The active system fitted to the all-new XK is complemented by a passive bumper system, the design of which helps to mitigate leg injury through the use of crushable foam and plastic covering. An advanced sensing system is mounted in the front bumper to help discriminate between a pedestrian collision and any other possible front-end collisions. The speed of the sensing time in the system is around one tenth of the time it takes to blink an eye. The complex system has been extensively researched across wide-ranging scenarios, using 120 man-years and thousands of computer simulations, as well as tested in practice at Jaguar’s Engineering Centre at Whitley in Coventry, England. While all pedestrian impact research has been carried out using virtual tools, analysis of previous 'real world' incidents has played an important part in the development process. One of the impressive points about the new XK's pyrotechnic deployable bonnet system is that it can lift the bonnet (which weighs 18kg) in around 30 milliseconds, which requires an acceleration rate of about 50 times the force of gravity (50g). Physical research carried out by the Jaguar development team has included investigation of various impacts including inanimate objects such as motorway cones. This is a vital part of the process to allow the system to differentiate a person from other impacts that can be experienced in day-to-day driving. 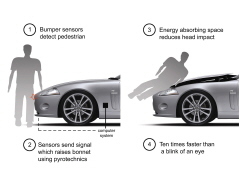 The Jaguar pyrotechnic pedestrian deployable bonnet system normally operates at vehicle speeds where it provides the most benefit and is automatically disabled outside of this speed range. The system is completely separate from any other crash protection system on the vehicle, including airbags. 'The Pyrotechnic Pedestrian Deployable Bonnet in the all-new XK is a leading safety technology that goes hand in hand with an advanced Jaguar sports car, sitting alongside a beautifully crafted luxury interior, aluminium technology and scintillating, dynamic performance.' said Russ Varney, Chief Program Engineer for the XK series.